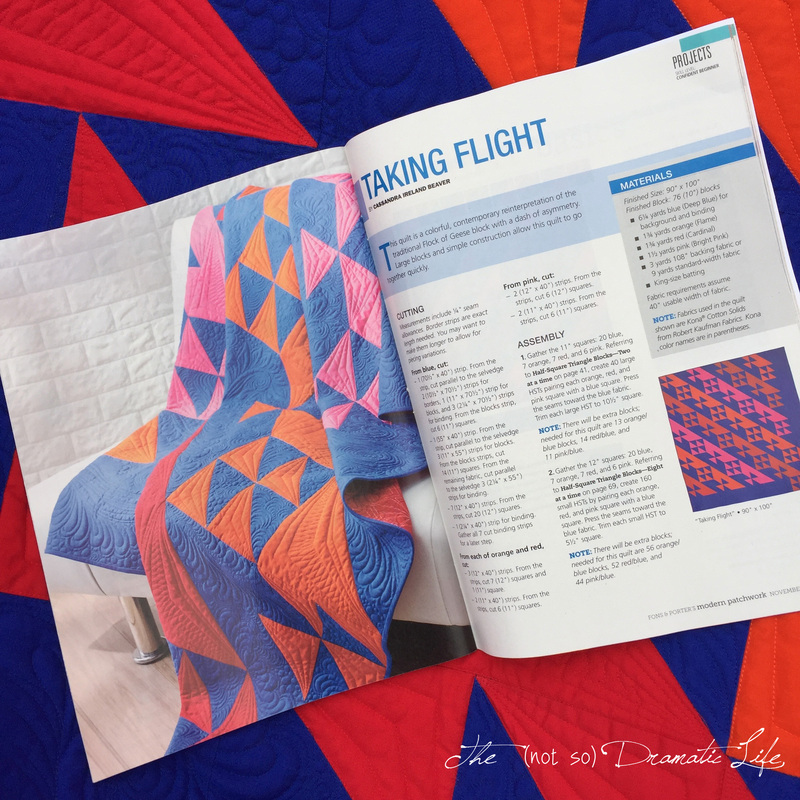 Taking Flight is is a contemporary reinterpretation of the traditional Flock of Geese quilt block with an asymmetrical twist. This quilt is now a project in the November/December 2017 issue of Modern Patchwork. 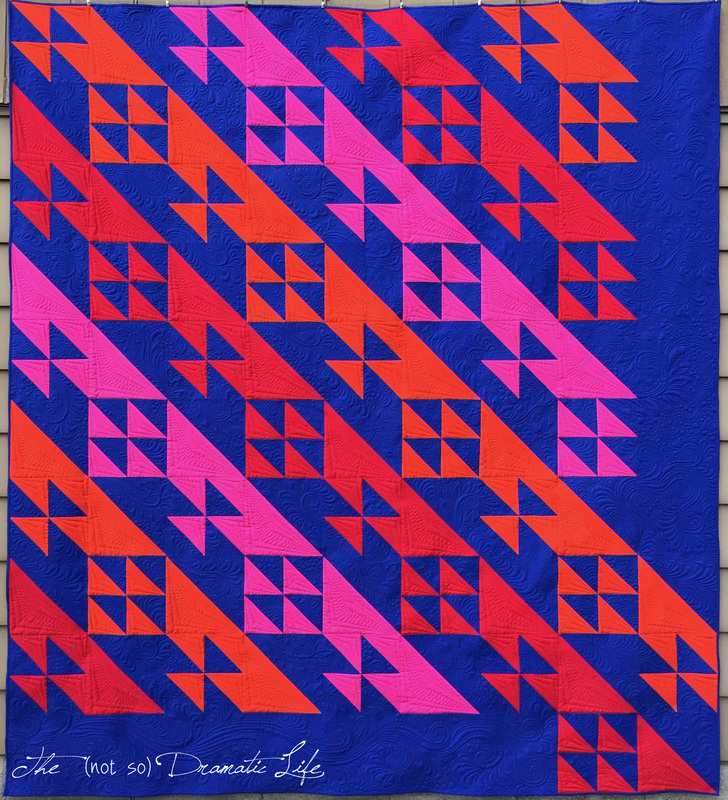 I designed this quilt shortly after completing Overlay (post coming soon), so I was apparently really into the Flock of Geese Block. 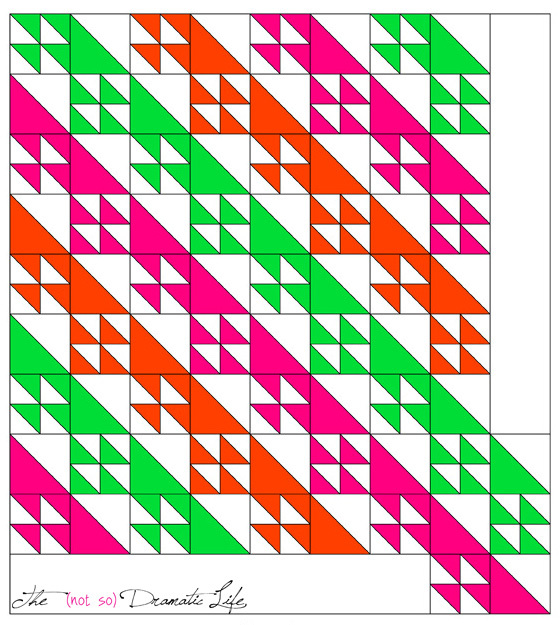 The blocks are rather large- each large half square triangle (HST) measures 10″ square, meaning that a full block is 20″ square. 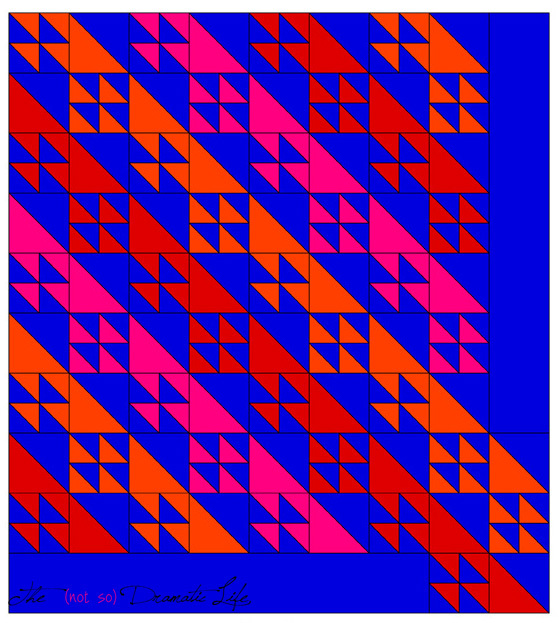 I had drafted the quilt in my usual AutoCad and did a lot of experimentation with possible color schemes. My top two choices were citrus-y colors with a white background and a play of warm and cool colors with the red/orange/pink and a blue background. Both color ways were included in the magazine proposal, and I am thrilled that they liked the blue background the best. I have done a lot of white backgrounds in the past few years, so it was exciting to work with a mid-value-range color scheme. The quilting in the warm colored areas is ruler work with a touch of free motion in a wishbone design. 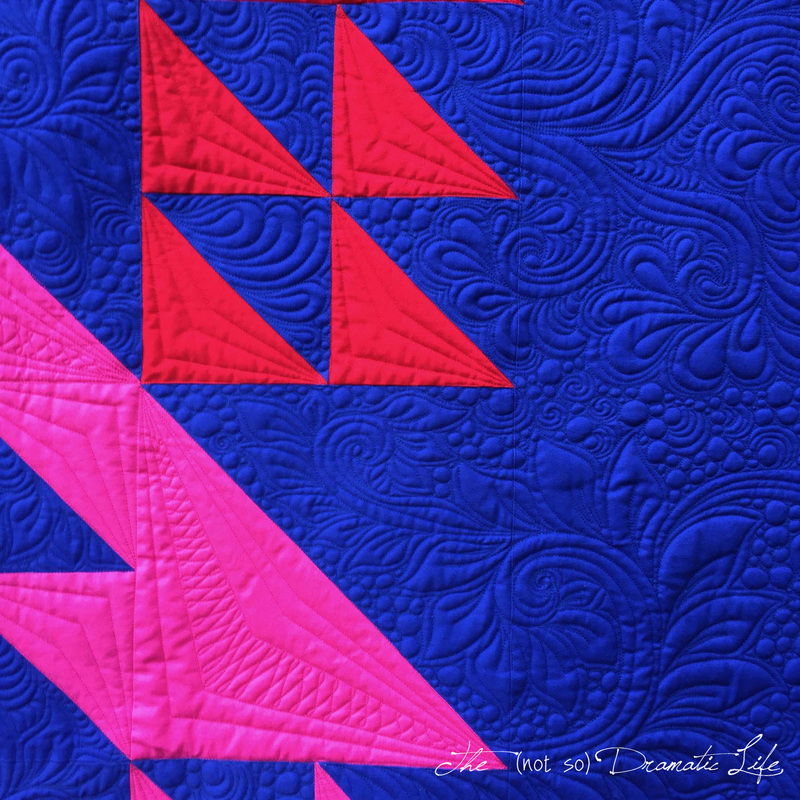 The blue background is filled with mixed motif free motion quilting. The feathers in these areas relate to the title- Taking Flight. Here is the magazine cover so you know what to look for at the newsstand! 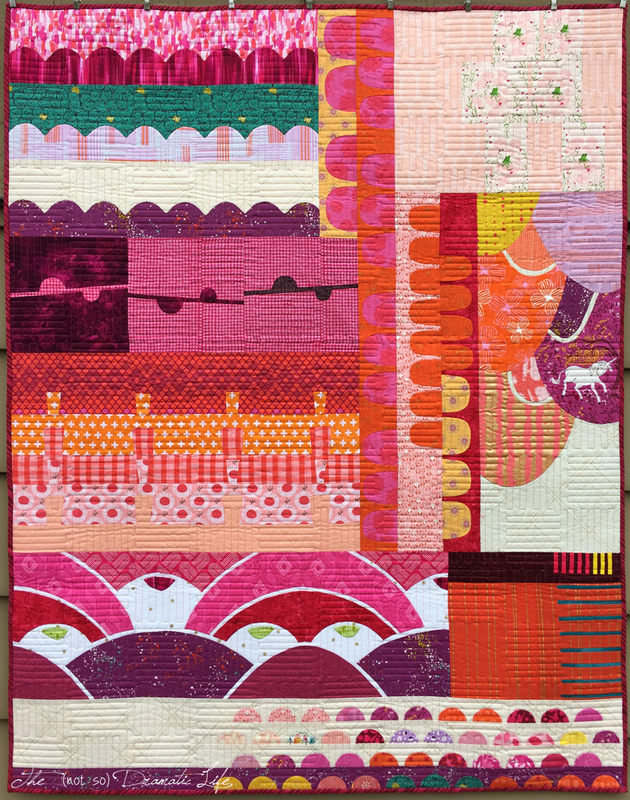 Last year, I was thrilled to teach Carolyn Friedlander‘s Collection Quilt through a local quilt shop, Sew to Speak. The first version I made as a class sample is similar to the overall aesthetic that was used in the original design, so when I constructed a second version to use for demonstration purposes, I thought it would be fun to do something entirely different. This is my pink-loving-little-girl version! My color palette this time around was mostly pinks and oranges with some red and violet and shots of green. Some fussy cutting added a bit of whimsy to the overall aesthetic. 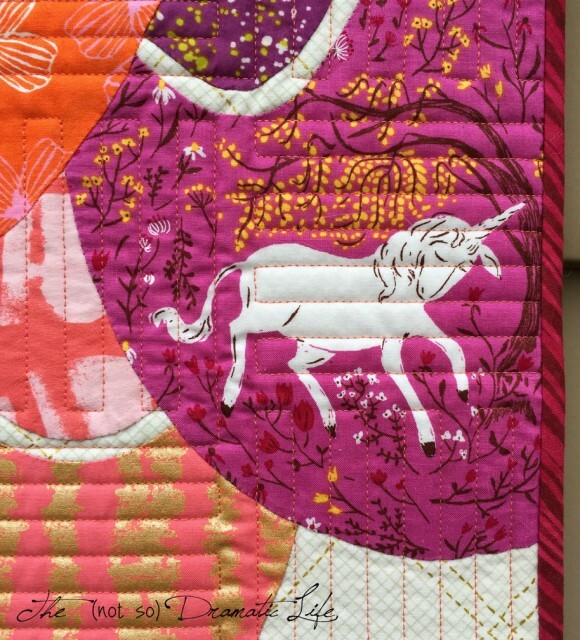 The backing is the same fun unicorn fabric that appears in the front in a different color way. 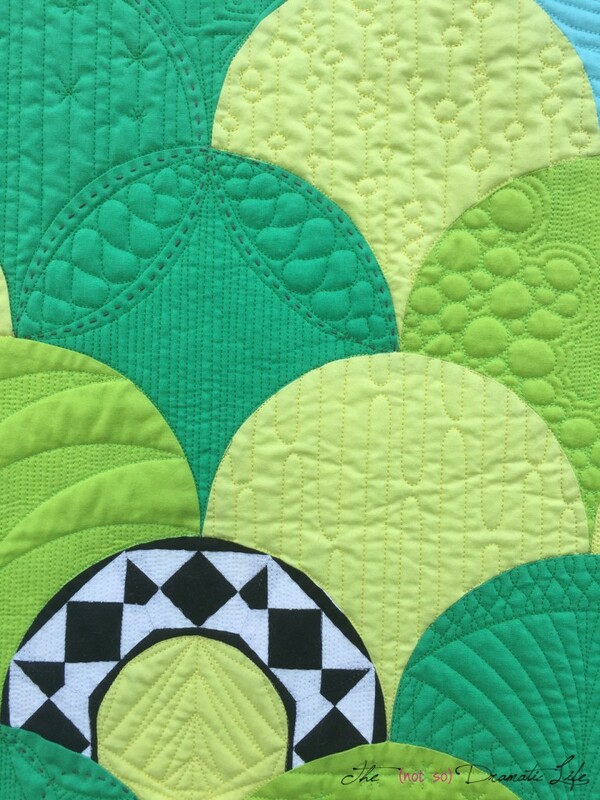 This quilt is the perfect way to learn needle turn appliqué, and I am excited to be teaching it again this year! Each month we will do a block that build on the skills covered in previous meetings. 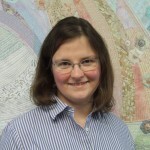 If you are interested in joining the class, please contact Sew to Speak in Worthington, Ohio. 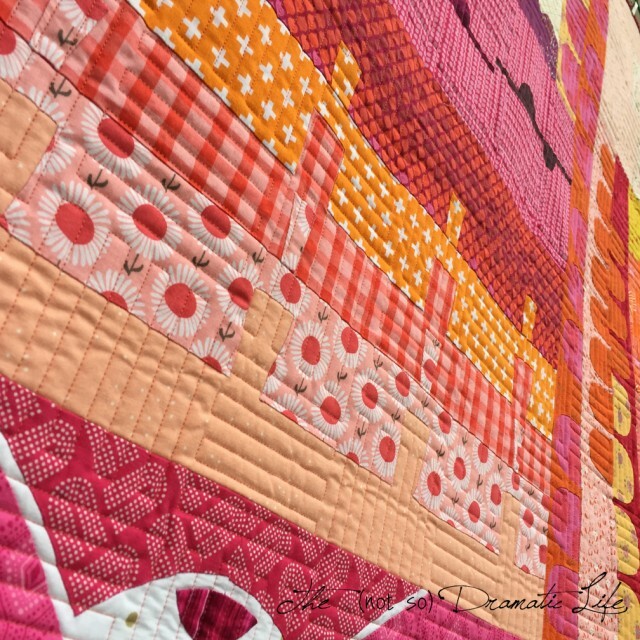 This technique opens up a whole new range of quilting designs! Binding: Striped bias binding, machine stitched to the front, hand finished on the back. 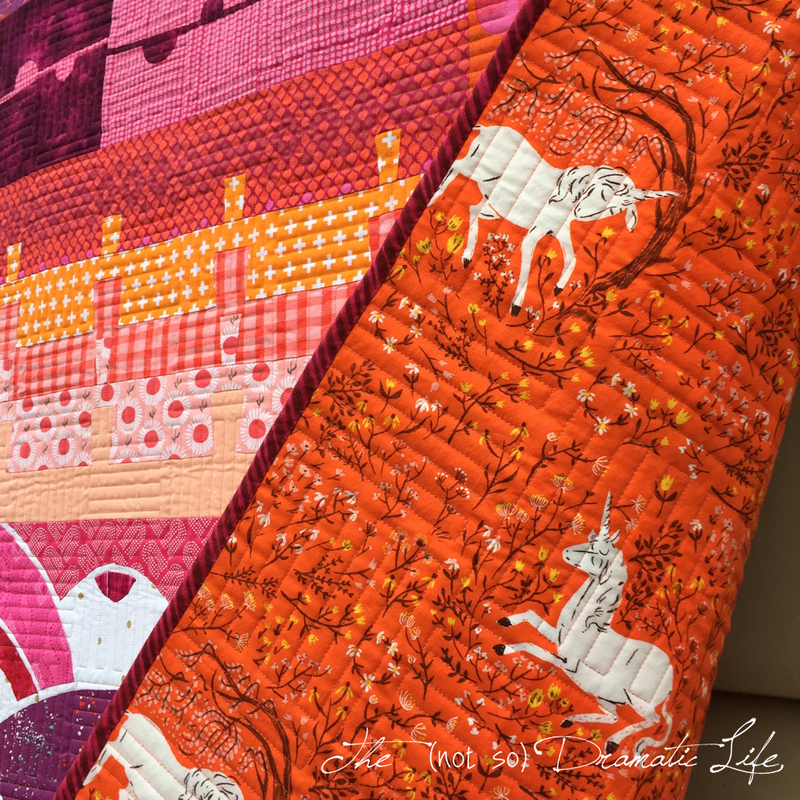 Every year The Blogger’s Quilt Festival hosted by Amy’s Creative Side brings tremendous inspiration to us all- I love seeing so much lovely work collected in one place! 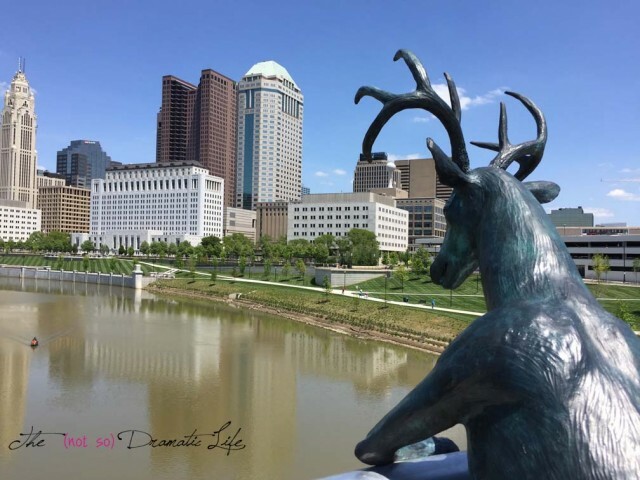 I am thrilled to submit “Columbus Skyline” as an entry into the appliqué category of the festival. Hand stitched needle turn appliqué is used to create the city skyline. I selected bright colors to reflect the vibrant community within the city. 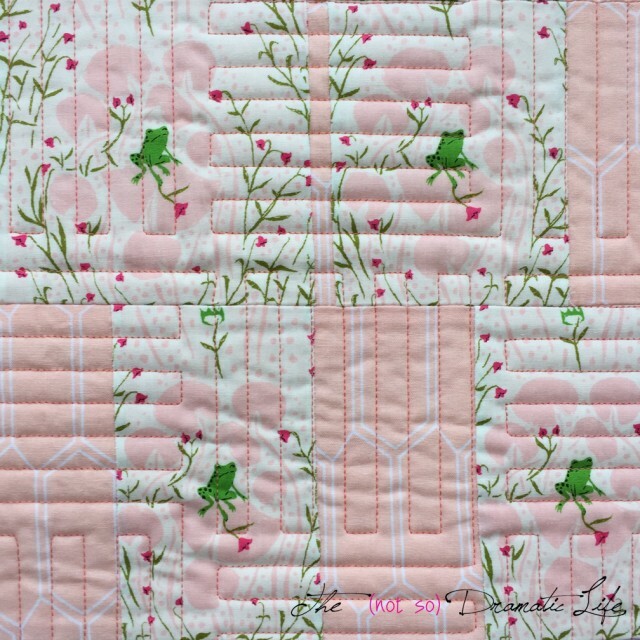 This small quilt is finished with borders that provided a space to quilt in both the shop and city names. 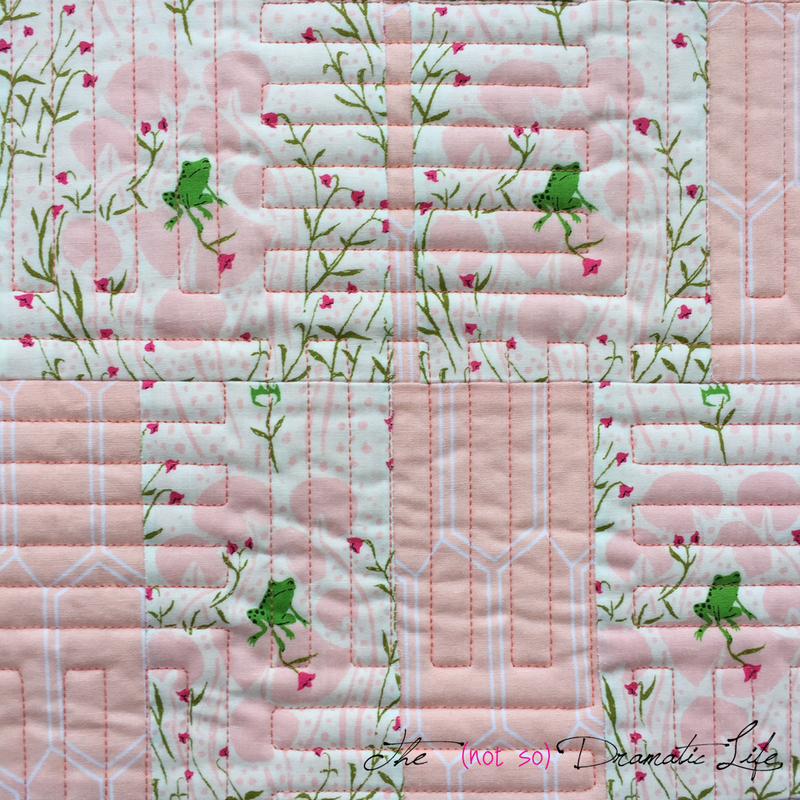 The quilting is done in thread to match each building so the design is reflected on the back of the quilt. This year Dabble and Stitch, a fantastic local quilt shop in Columbus, Ohio asked me to design their row for the Row by Row Experience. It was their first time participating in this event, and it was my first time designing for it. I am really excited by the results, and I hope lots of people get to make up this fun block. During the Row by Row Experience the patterns are available for free in their “home” shop, but can only be distributed by picking them up in person. Kits for this row are available for $20. Later this year the pattern will go up for sale and can be sent to you if you can’t make it to the shop. 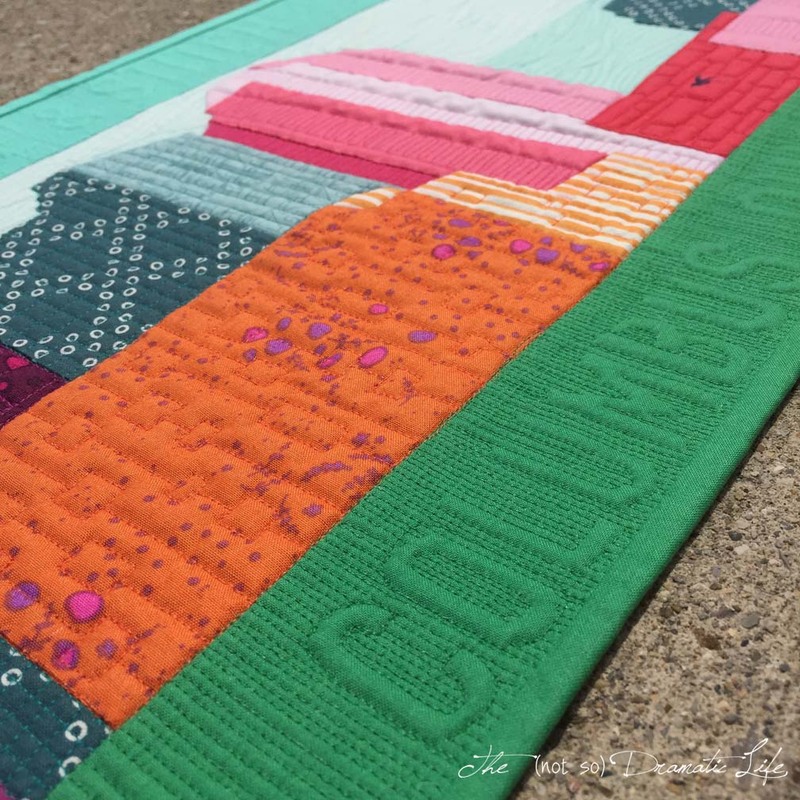 The theme for this year is “Home Sweet Home,” and we thought it would be great to create a row featuring the Columbus skyline. This view of the city is taken from a bridge in Bicentennial Park. I was standing right next to this guy as I snapped the photos! Using the photos I took, I designed and rendered the skyline using AutoCad and Photoshop. The block is constructed using needle turn appliqué, but you can also do raw edge appliqué using this pattern since I included lines on the templates that show the finished sizes of each piece. This is what the row looks like finished and ready to incorporate with other rows. For the shop, I made the row into a mini quilt by adding borders. 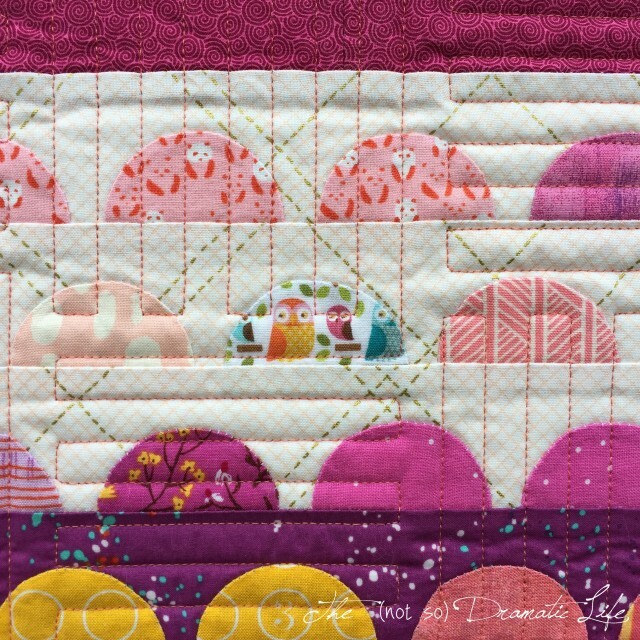 The quilting changes from building to building, and for added fun, I quilted the shop name and city into the borders. I think this looks great as a mini, and I am hoping to make one up as a long pillow for a sofa or bed. 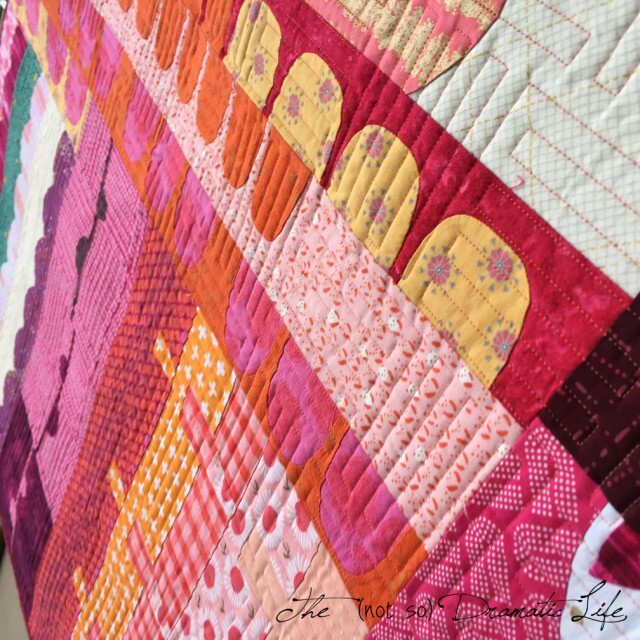 I love mixing up my quilting thread colors to match the fabrics on the front of the quilt. I went with a white fabric on the back to show off all of that quilting. If you are traveling through Columbus this summer, I hope you stop in to pick up a pattern! Binding: Straight grain binding assembled to match the borders of the mini, cut 2″ wide, machine stitched to the front, hand stitched to the back. 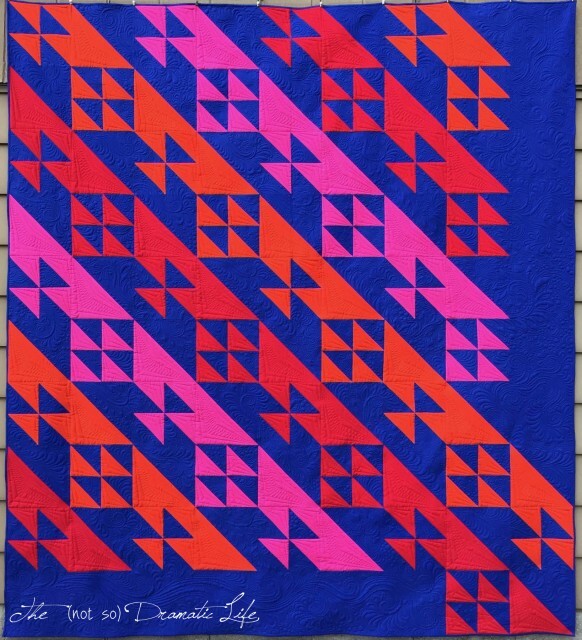 This year’s Modern Quilt Guild / Riley Blake fabric challenge was one of the best challenges I have ever participated in, and I am very excited about the resulting quilt! 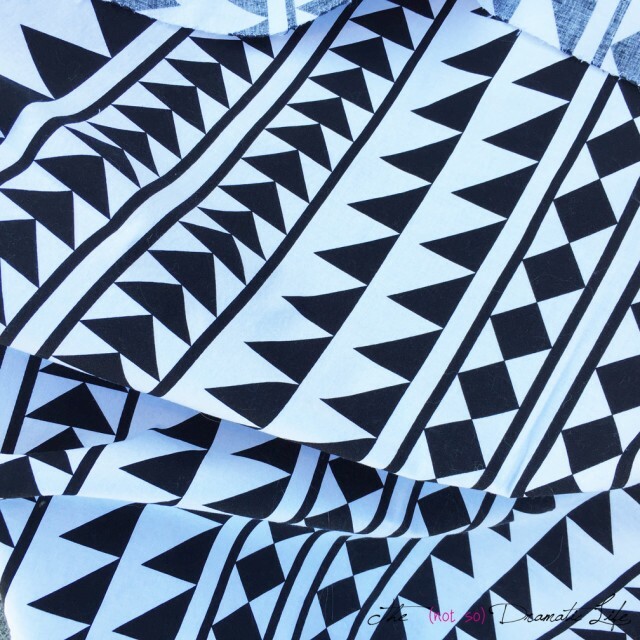 The print that was selected for the challenge fabric has almost endless possibilities since it contains so many different designs. I had the fabric draped around the studio for a long time before I decided what direction I wanted to go with it. I still wasn’t entirely certain what I was doing when I ordered the solids to coordinate. Emerald green has been very appealing to me lately, and I decided to draw my color scheme from it. I enjoy taking linear prints and cutting / reassembling them into a star formation, and I started out thinking that was where this project would lead. In an effort to step out of my star-shaped box, I decided to consider other options that could produce a similar effect with the pattern of the print. I drew the fabric print to scale in AutoCad and started to experiment. Ultimately I landed on this design based on a traditional clamshell configuration. 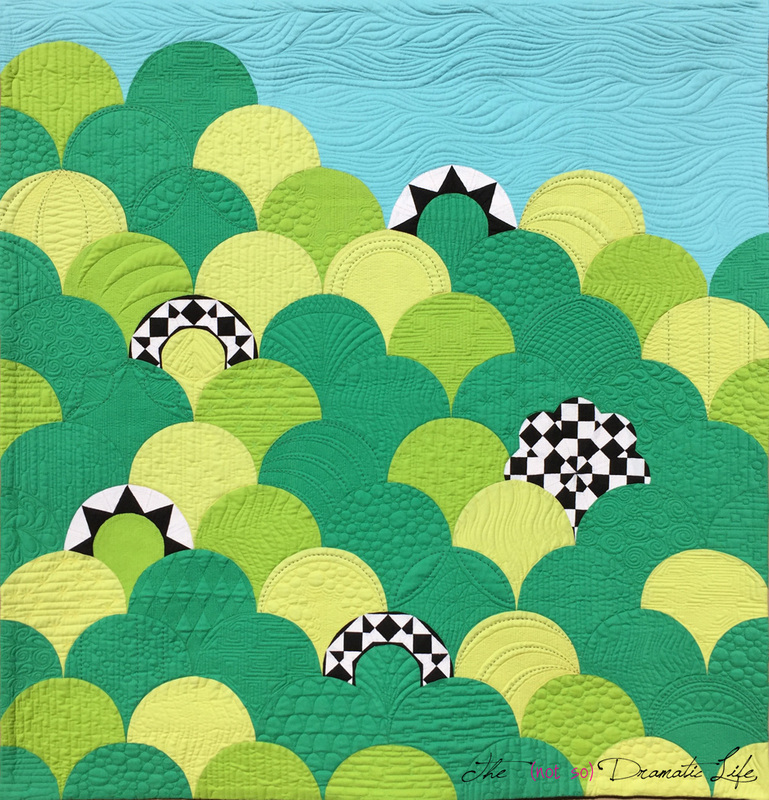 I thought that the greens I had selected would create the illusion of abstract rolling hills, and the black and white print would look like giant flowers bursting forth from the landscape. I developed and printed templates for each shape using AutoCad. Since I had already planned the design with the fabric in mind, I was able to print the templates with guidelines that matched the print. Cutting was super easy this way! The clamshells are machine pieced to one another. I used the templates to mark the start, center, and end of each seam which helped me to accurately position and pin each seam. The top row of clamshells is hand appliquéd to the light blue background fabric. The quilting was the most fun part of the process. Solid fabrics give so much room for play, and I loved the idea of creating movement in this piece. Each “hill” has a different texture from those directly around it, and the quilting thread matches each section. 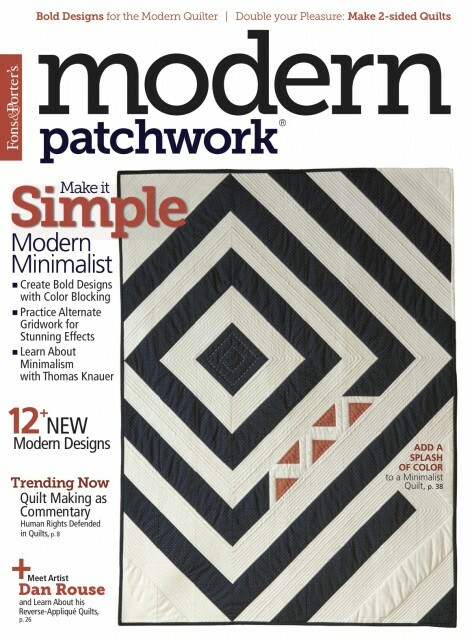 This is also my first project to incorporate hand sashiko stitch quilting. 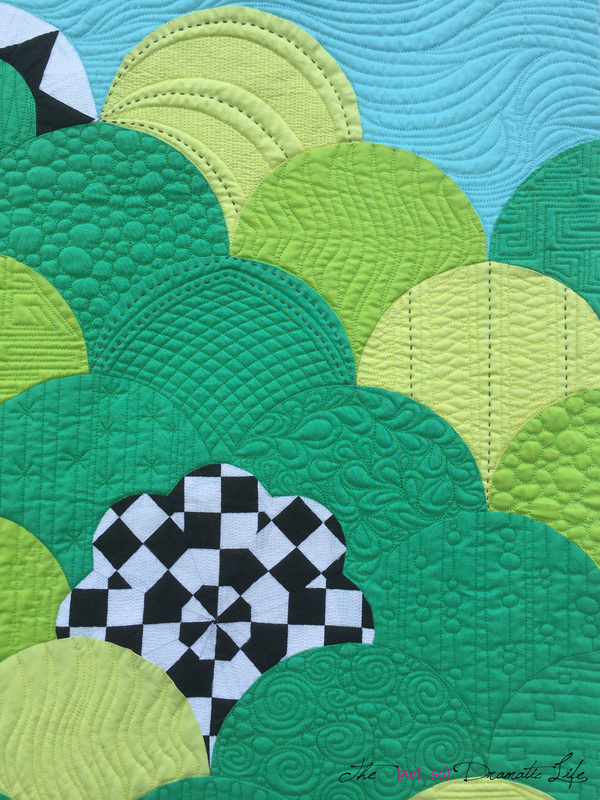 The large stitches in contrasting thread helps to draw your eye around the quilt. 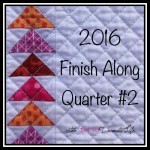 I was excited to submit this quilt to the challenge, and I was absolutely ecstatic to find out that it received second place! If you would like to see the other fantastic quilts that placed in this year’s challenge, you can find them on this Modern Quilt Guild blog post. Thread: Pieced and appliquéd with coordinating Gutermann Mara 100 thread. 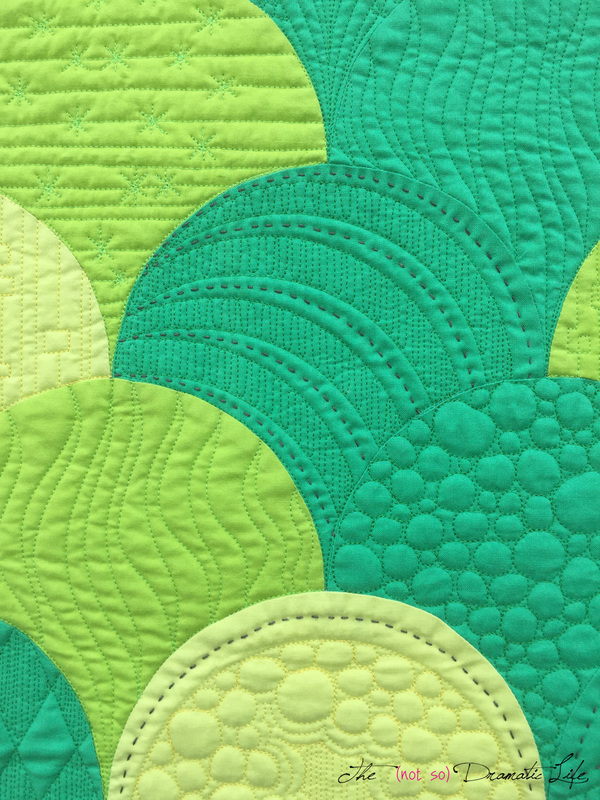 Quilted with five colors of 50wt Aurifil cotton thread. Sashiko stitching done with dark grey Aurifil Floss.